I could live on caramel and pecans and chocolate. 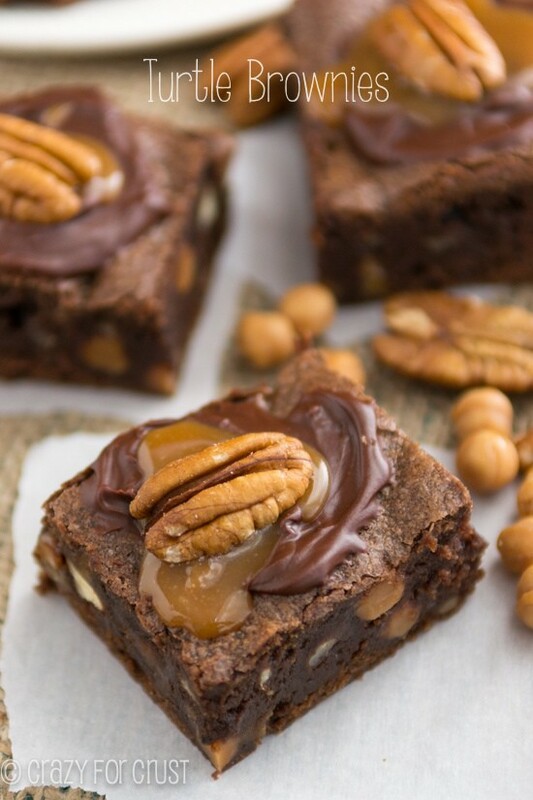 If you’re like me, then these Turtle Brownies could sustain you for a day or two, because they are chock full of caramel and pecans and fudgy chocolate! My mom was a meter reader when I was a kid. She worked for the power company and would spend her days walking miles and miles (and miles) from house to house, reading the electric meter. I used to love the days she was in my Nana’s neighborhood, because I’d get on my scooter and ride along with her while she walked. One time, I remember she found a turtle. I don’t know where she found it, or why she thought to bring it home, but she did. We immediately made a home for it in the bathtub. I remember watching it scurry around eating lettuce or something green. I don’t remember how long Mr. Turtle was with us but I don’t think it was that long. I’m pretty sure that was back when there was only one bathroom in the house and we had to take showers. I think I remember my mom telling me he “ran away” and I searched for him under furniture and in cabinets and never found him. I’m pretty sure my mom’s definition of “ran away” is different then mine. I don’t know why but whenever I think of the Turtle candy, I think of that turtle. I also think of my mom because turtles are one of her absolute favorite candies. She’d get a box and it would be gone before I could beg for seconds (or thirds). I’m sharing these Turtle Brownies today because Saturday is my mom’s birthday. These would be the perfect way to celebrate her day. And guess what mom? The entire batch (er, minus one) is in the freezer waiting for you on Sunday. They’re all yours! These brownies combine my love of super fudgy brownies with caramel and pecans. And when I say super fudgy I mean super x1000. My favorite brownie recipe, which I’ve shared a million times, has three kinds of chocolate in them: semi-sweet, unsweetened, and cocoa powder. Mixed with the melted butter and sugar, these brownies are chocolate and rich to the extreme. Note about cocoa powder: you can use regular unsweetened or the Hershey’s Special Dark. I actually used a combination in this recipe (1 tablespoon of each) because I ran out of regular in the middle and was too lazy to walk out to my storage area in the garage and get the new container. Use what you have! 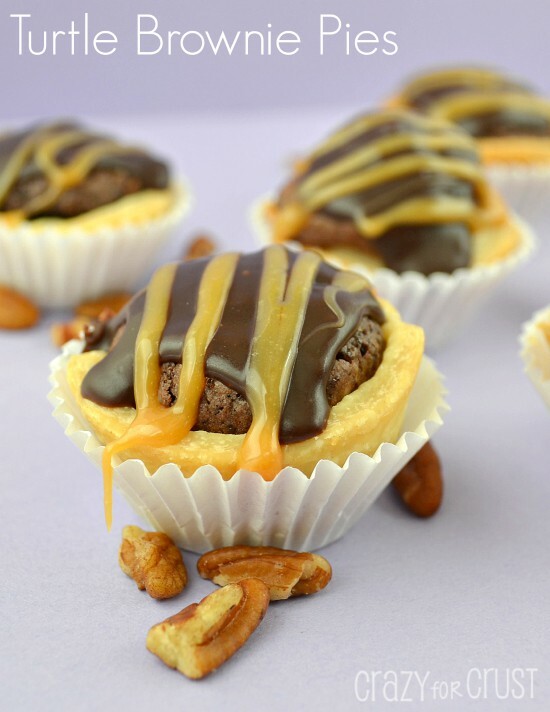 The “turtle” in these Turtle Brownies is doubled because the brownies are filled with caramel bits and pecans, and then topped with chocolate, caramel, and a pecan half. It’s like a turtle on top of a turtle brownie. 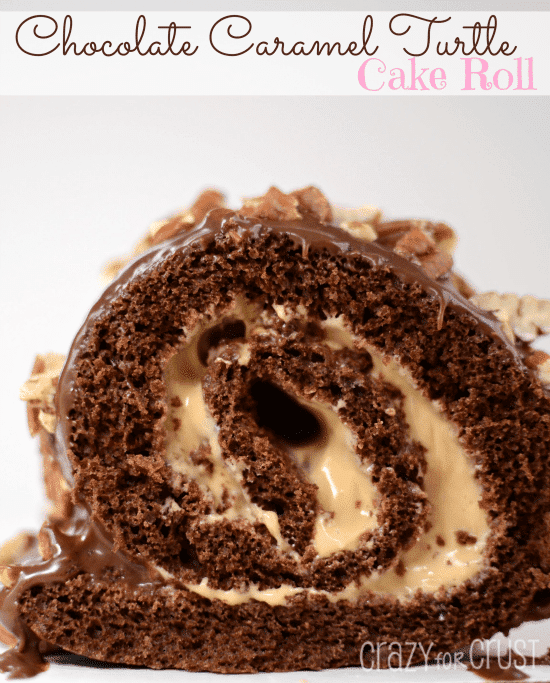 Note: if you can’t find the caramel bits (a Kraft product), you can use chopped Rolos or Hershey’s Caramel Kisses, or any other similar candy. I always find the caramel bits at my Super Target, occasionally at Walmart, and sometimes at different grocery stores. I love my brownies underdone. That’s what gives them the immense fudgy look and taste. A brownie that is overcooked is not fudgy – it’s just crumbs. These brownies are stick-to-the-knife brownies. I baked mine for 23 minutes but the instructions specify 23-28. If you prefer them more done, cook them longer. My toothpick, one inch from the edge, had crumbs on it when I tested them. 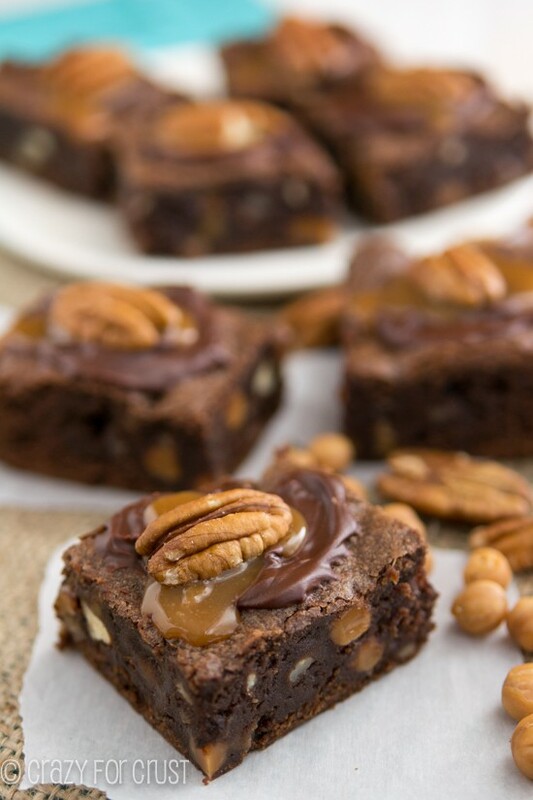 If you love Turtles…you’ll love these Turtle (Caramel Pecan) Brownies. Mom, I may have to steal one more of them. Preheat oven to 350°F. Spray a 9x9” pan with cooking spray or line with foil and spray with cooking spray for easy removal. Add unsweetened baking chocolate, 2 ounces semi-sweet baking chocolate, and 3/4 cup unsalted butter to a large microwave safe bowl. Heat in 30 second increments, stirring between each, until melted and smooth. Stir in sugar, then eggs, one at a time. Stir in vanilla extract and cocoa powder. Gently stir in flour. Let brownies cool completely at room temperature, then cut into 16 bars. Melt 1/4 cup caramel bits or 6 caramel squares with milk in 30 second increments, stirring between each. Spoon about 1/4-1/2 teaspoon of chocolate on each brownie and smooth out with the back of a spoon. Top with a drizzle of caramel and a pecan half. Let cool to set. I don’t recommend refrigerating these to speed the chill time. The caramel will get hard if they are chilled. Store them in a covered container at room temperature. Oh YUM!! I LOVE Turtles!!! There are calling me from the screen to go home, make them, and eat the whole pan! Oh, boy! 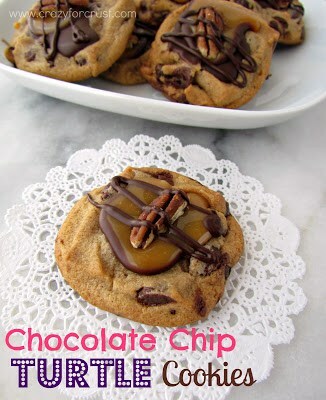 That caramel is totally calling my name today. I adore under cooked brownies…no crumbly ones here! Happy Birthday to your mom. She is going to love these!!! Crumbly, never!! 🙂 Thanks Jocelyn! Where does the salt go? Directions don’t say. Sorry about that Charlene! Just in with the flour and dry ingredients! Hi! These look amazing! I was wondering how long these can be kept in the freezer for? And what the procedure would be to thaw them? Also should I double the recipe if I want to make them in a 9*13 pan? Does that affect the baking time?